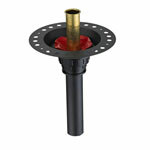 Height to base of spout 32-1/4"
The Contura II 6636 tub is completely customizable. The configuration shown here is just the beginning. Review the list of options to create the tub that is perfect for you. The possibilities are truly endless! Contact us with questions on how to create your ideal bathtub. The Contura II 6636 Tub is made in the USA. Hand-built using the highest quality acrylic materials, the Sirena features a 20 Year Residential Warranty*. DimensionsExterior Size - 66" x 36" x 24"